Based on Cú Chulainn, who is an Irish mythological hero who appears in the stories of the Ulster Cycle, as well as in Scottish and Manx folklore. The son of the god Lugh and Deichtine (sister of Conchobar mac Nessa), his childhood name was Sétanta. An ancient hero living in the Illusional City. 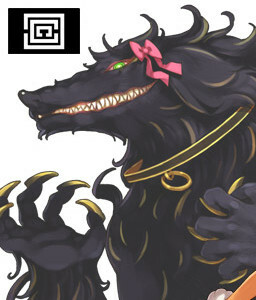 Not only is Cú very powerful, being able to defeat enemies with a single strike, she can also transform into a black beast. She calls the protagonist "onii-san" and likes to tease him, not to mention is always trying to seduce him. "Okay! Manage me by meat stick, Yamato!"